Robert Altman is best remembered for his acclaimed 1970s pictures (M*A*S*H, Nashville, The Long Goodbye, McCabe & Mrs Miller) and the movies from his 1990s resurgence (The Player, Short Cuts, Gosford Park). However, the 1980s was a difficult period for the director, and the decade saw Altman churn out a series of barely remembered flops including O.C. and Stiggs, Beyond Therapy and 1983’s Vietnam War-era drama Streamers. The film is based on the acclaimed Broadway play by David Rabe about a group of US soldiers waiting to be shipped out to Vietnam, and Rabe himself adapted the script. Unlike many Vietnam War dramas of the time, Streamers is less about politics or the dehumanising effect of war, and more concerned with the idea of how war throws men of wildly different backgrounds together and the subsequent tension it generates (in terms of race, class and sexuality). The soldiers here are seen to have a minimum amount of fear or fascination about what they’ll be facing in a combat zone. Instead, they lie around, take showers, get drunk and exchange increasingly cruel insults. 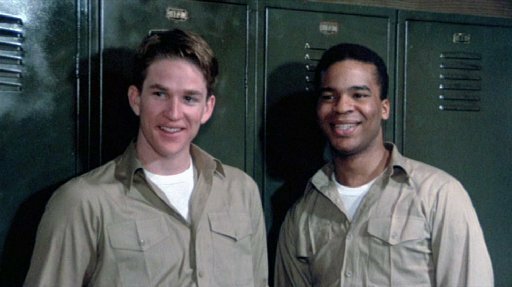 Matthew Modine (who would later go on to play another soldier about to ship out to Vietnam in the first half of the superior Full Metal Jacket) plays Billy, a college-educated Wisconsin white boy who strikes up a friendship with black recruit Roger (Grier). They both struggle to accept that their roommate Richie (Lichenstein) is gay, especially when Richie indicates that he fancies Billy. The tension is further heightened by the arrival of Carlyle (Wright), a disturbed, hate-filled young man from Roger’s neighbourhood who pushes the plot towards its inevitable, rather protracted tragedy. Rounding off the cast are perennial supporting players Guy Boyd and George Dzundza as two permanently drunk sergeants who recount their previous combat experience to the young recruits in heroic detail. These two characters give meaning to the movie’s title, explaining that it’s a song warbled by paratroopers whose chutes fail to open (there’s probably a metaphor in there somewhere folks). It’s a slow-moving, dreary movie that is enlivened by some excellent performances. The key players manage to bring these often-obnoxious characters to life, and their efforts were rewarded with a Best Actor award for the entire cast at the 1983 Venice Film Festival. Despite this, Streamers remains a difficult watch. It’s notoriously difficult to bring a play to the screen without it either losing the spirit of the original or becoming little more than a filmed play, and with its single-set location and subtle camera movements Rabe and Altman make little effort to disguise the story’s stagebound nature. Presumably, they were aiming for a tense, claustrophobic atmosphere, but the monologue-heavy dialogue just makes the movie feel contrived and destroys any real sense of realism. It’s always intriguing to rediscover the back catalogue of one of America’s key directors, but this gruelling movie indicates Altman was far more comfortable working with ambitious, multi-stranded narratives than he was with low-key drama.